Anne Goldman has been involved in ceramics for over twenty years. Her work is represented extensively in galleries, museums and private collections throughout the U.S., Europe, and Asia, and has been featured in numerous one-woman shows. Her many commissions include the U.S. embassy, Bahrein; the Executive Suites of Tokyo's Sekitei Hotel; the Laguna Beach Hilton; the Presidential Suite of the Hyatt Regency Maui; the Private Tasting Room of Napa's Robert Mondavi Winery; and Van Cleef & Arpels in New York City as well as Sacramental and Baptismal pieces for a church in California. Recently, her vessels were exhibited at "il Salone de Complemento di Arredo," the international design show in Milan, Italy. Anne's work has graced the White House Christmas tree of Hilary Rodham Clinton, and has been featured on several television series. Born in New York City, Anne's first profession was as a classical ballet dancer until illness ended a promising career. She married, moved to California, and enrolled in Anthropology at the University of California at Berkeley. 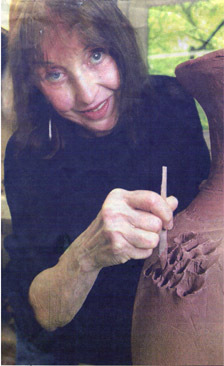 In the 1970's she started working with clay, focusing on textured functional forms. In the '80's, her work took on increased sculptural aspects, which she continues to develop.